Back in September, I wrote about the start of my school year and how I was helping students see the opportunities within revision. Students sometimes over-commit to their first words, and I was working to push them beyond. Some of the things I always assumed I did an excellent job clarifying were the bits and pieces of the writing process. 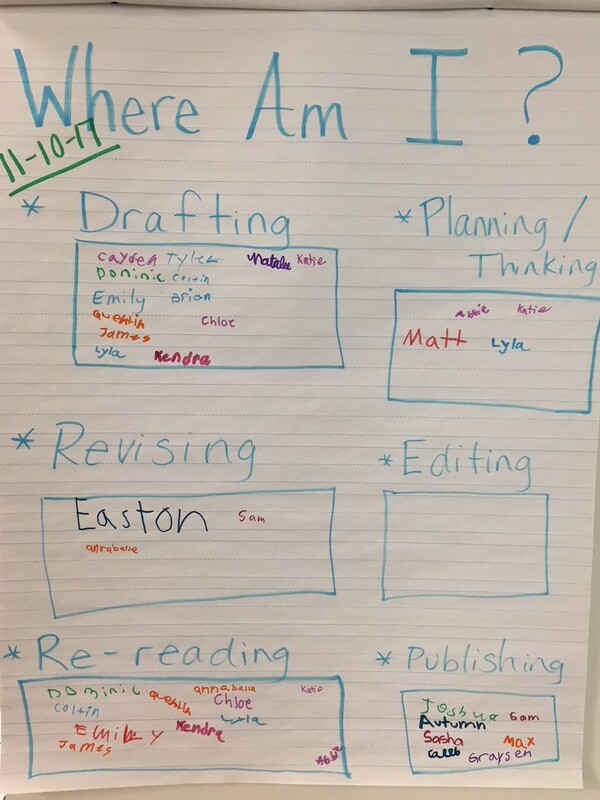 Students come to me in third grade having heard words like editing, publishing, and planning. However, as writers grow the process of writing evolves, and words like prewriting and drafting take on different characteristics. I think I assumed that students were walking through the understanding of that evolution alongside me and maybe some have. However, it became evident last week that students were confused by some aspects of the process and what they mean. I asked myself, “Does it matter if they can or can’t name where they are in their process?” I decided it did matter and that I wanted them to look at each part of the process individually. I also felt it was another perfect opportunity to remind them that everyone cycles through the different parts of the process in their own way and with their own individual rate of recurrence. Writers might even find themselves in two spots at once. 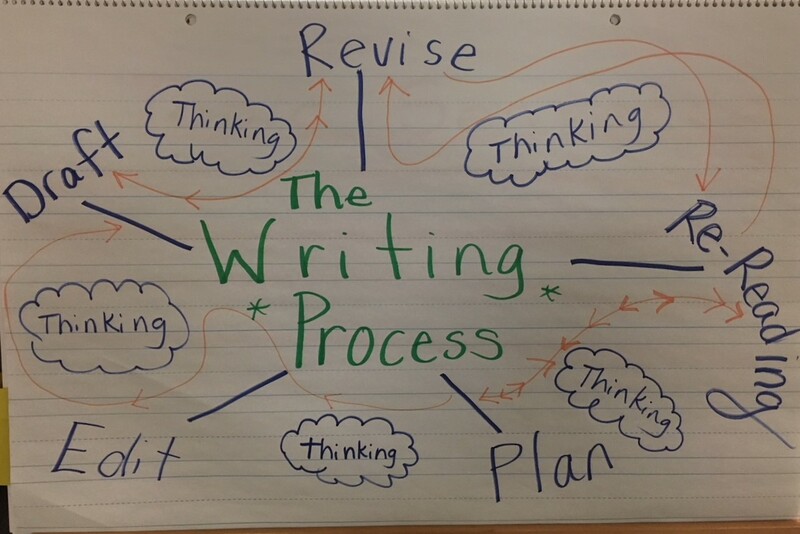 As kindergartners or first-grade writers, their process might have been more linear but not because it had to be. For five and six-year-olds, once their stamina for workshop was increased, I found young writers could weave through all the parts of the writing process within one or two workshops. As third graders, these students are moving in and out of different parts without realizing it, and they are also skipping over parts without realizing it. I decided I needed to gain a better understanding of what they really thought each part meant. So I started by asking, “What does it mean when I say I am drafting?” The students seemed to understand that this meant I was writing words down but some thought it was when I was “supposed” to re-write my words neater or it was only allowed after planning. Then I asked them, “What is revision?” Still, even after all these weeks of trying to model what this work really looks like, after charts, conversations, and small groups students still sputtered out answers like, “It’s when you add more or make it neater.” A few students talked about making word decisions, and some spoke about re-organizing which gave me a glimmer of hope, but I was still disheartened by some of the responses I heard. It made me realize they are still fearful of flexibility. Deviating from a step they have learned is scary and trying something different doesn’t excite them, it makes them anxious. I model writing for my students on almost a daily basis. If I am not modeling my own writing, we are looking at someone else’s writing, or I am modeling something within a piece of writing I’ve already written. I try to attach every objective I teach to my own work, right alongside my students. I know this is powerful, but it isn’t enough. I need to be sure I am showing them that my process is anything but linear. I decided to make this chart to show them how I process through a piece of writing and as you can see, though it looks circular, it is not in any particular order, and some arrows go back and forth. Then we talked about publishing separately. I asked the students, “What is the purpose of publishing a piece of writing?” We had been talking about our audience a lot through our persuasive unit, so some students were able to answer that it was an opportunity to share our work. I was able to have a few students share who the audience had been for some of their published pieces. I then challenged students to think about what their process was going to be like for the day. I made a quick chart reflecting each part of the process we had discussed. Some students put their name in one or two boxes before starting their independent work, and some jotted their names during the teaching share. We were also able to look at several examples of what different students work looked like within different processes. Some were on Chromebooks typing letters to the superintendent, other were planning in their writer’s notebooks, some had talked through their ideas or re-read their piece to a partner. One student shared that she had tried the “pretend stranger” technique and re-read her piece pretending to be her mom, asking herself if she had been convincing enough. In the end, after about three days of working through all these misunderstandings, I am ready to go into the week with the hope that we all can be vulnerable within our writing process. Steps are meant to be taken but we all move at our own pace, and sometimes the pace depends on our comfort within our topic. It also reminded me that I may need to revisit all these conversations again through all the channels of small groups, individuals, and with the class as a whole. As teachers, I think we sometimes wish we could snap our fingers and help everything fall right into place. What might have been understanding a year ago changes and as students add to their repertoire of knowledge synthesizing all of these new understandings is a challenge. I appreciated the reminder to always be mindful of connecting to what they know and never assuming their head nods mean “I’m with you.” Sometimes they really are a little lost on their path and need some re-direction to get back on their journey as a writer and as a learner in general. What do you find students lose track of as the year goes on or when transitioning into a new school year or even something as small as a new unit? Maybe asking yourself some of these same questions will give you a deeper look into your students and their lives as writers. Love, love, love your chart. The writing process is so difficult to explain because “revising” can occur at so many points. This is critical. “As third graders, these students are moving in and out of different parts without realizing it, and they are also skipping over parts without realizing it.” Finding out the students’ understanding was critical to your process.